Is Shell’s news good news for the stock? Since our last look at the Royal Dutch Shell (left: Shell: From oil to green electricity. Will this boost the share price? 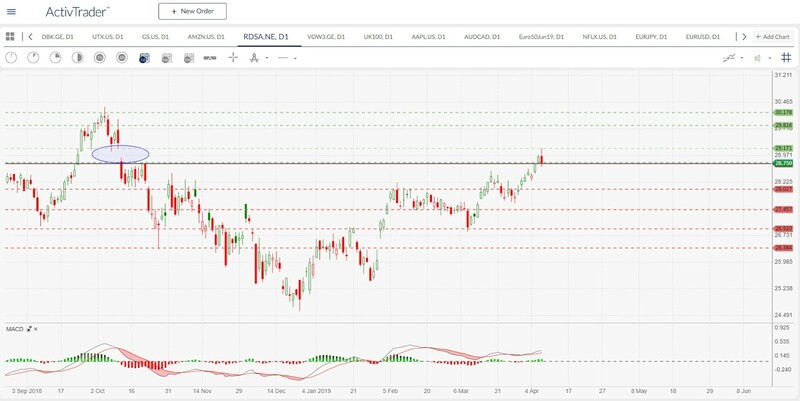 ), the stock was able to move above the significant structural level of €28 and even rise above the next resistance at €28.75. The price also climbed above €29 to the top of the 11 October 2018 gap, but only for a short time. With yesterday’s candle, the market took a halt at the structural level at €28.75. This resistance acted as support for the market. A few days ago, the company hit the headlines again, as it was reported that the company wanted to leave American Fuel & Petrochemical Manufacturers, the most important American interest group in the oil sector. According to Shell, the move was justified by conflicts of interest between Royal Dutch Shell’s new climate policy course and that of the interest group. This action underlines Shell’s farsightedness in realigning the company, which sees oil and gas as a dated model. Shell could thus freely set its course for the future. However, what do investors now think of the change in strategy? The candle which the market showed yesterday, is a classic bearish engulfing pattern, which could represent a bearish signal. In the MACD oscillator, the MACD line is above its trigger line, and the histogram is in positive territory. However, the MACD line tended to flatten somewhat at the end of the day, indicating a slowdown in upward momentum. The old resistance level of €28.75 is now becoming the central zone. If the market can break away from this, and also overcome the October gap at €29.17, the area between €29.81 and €30.17 could be the next larger structural zone for the market. However, if the bears take over, the area around €28.02 could provide initial support for the market. Further support levels could be in the range of €27.45, €26.92 and €26.38.